At the beginning of the 19th Century, New Bury was a part of the medieval parish of Deane, and later part of the parish of St John, Farnworth and Kearsley and in the Diocese of Chester. A school was built in the area 1840 which was licensed for worship in 1841. the collection at the first service was £40 which left the building debt free. There was pressure then to build a church and fund-raising began. The Earl of Bradford gave the site and £1,500 towards the building costs and a further £1,000 as endowment. The building was designed by Isaac Holden and Sons at a cost of £2,500 of which local people raised some £500 - a large sum from very poor people. For reasons unknown, the consecration of the new church was delayed for almost two years after completion. The consecration by Bishop James Prince Lee, the first Bishop of Manchester, took place on 30th December 1865. The first Vicar being Reverend C J Stewart. The church originally had a west end gallery complete with organ and seated some 600 persons in total. The organ was moved to the site of the present organ in 1883 and the gallery was taken down when the west window was dedicated as a memorial to those who died in the First World War. There have been many changes since - most noticeably the removal of pews over the years and the recent re-ordering of the chancel. The South-West Window – One of two modern windows designed by Francis Skeat and installed in 1965. Designs were drawn for two further windows in 1970 but presumably funds were not forthcoming to have them made. The Book of Remembrance for the Parish is beneath the window. The West Window - was inserted in memory of those who died in the First World War whose names are recorded in the glass. After the Second World War a plaque with the name of those killed was added. Below the figure of Christ in Majesty are scenes from the life of Jesus. The Font is not the original font but one that came from the Catholic Apostolic Church in Carlton Street when it closed in 1928. It closed in 1928. It has scenes from Christ's life and is said to be some 400 years old having been brought originally from a medieval church in Yorkshire – this however seems doubtful. The Nativity Window - was given by members of the Mothers' Union in 1965 to mark the Centenary of the church. The MU Book of Remembrance is beneath the window. A Mothers' Union Class was held in the parish as early as 1899 and a full MU Branch affiliated on 13th July 1911. The Parish Banner - hangs over the south door. The Girl's Friendly Society Windows - were given to mark the death of Queen Victoria in 1901 and completed to mark the Coronation of King George V and Queen Mary in 1911. The GFS was founded in the parish in 1897. The Organ - was dedicated in 1970 to replace the original which was over a hundred years old. The organ was built by Charles Smethurst of Manchester and consists of six units, namely Diapason, Flute, String, Reed, a ‘Straight' Vox Celeste and a repeating Mixture. The Chancel Windows - The small north window depicts Christ the Good Shepherd and the south window given by Samuel Horrocks in memory of his mother Sarah. It shows Christ holding a child. The East Window has the figure of St James the Apostle flanked by the four Evangelists under that of Christ th King. This is in memory of John Pendlebury of Top Fold Farm. All were installed in 1877. The Reredos - with its central panel of the Last Supper was given by George Norris to commemorate the safe return of his sons after the First World War. The Altar - completed the renewal of the sanctuary furnishings and was given in memory of Charlotte Aspinall in 1927. The Clergy Vestry - was built on in 1906 in memory of James Fletcher of Green Fold Farm. 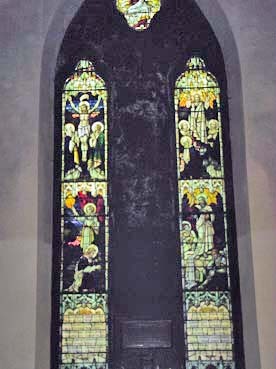 The Eli with Samuel Window - was given in 1920 in memory of James and Hannah Fletcher by their daughter Mary Smith. That completes the brief tour of the church with the exception of pointing out the book table at the entrance which was given in 1956 in memory of Raymond Tonge and made locally by Frank Hall & Sons. The Church is built in the Early English style, of about the middle of the thirteenth century with a small west end bell cote with one bell. The contractor for the building was Herbert Neill of Manchester with the stone being quarried at Little Hulton Quarry. 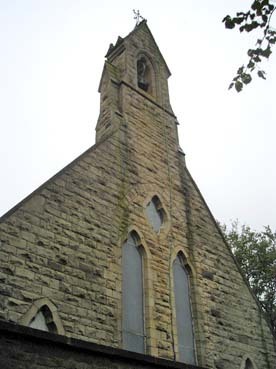 The Foundation Stone was laid on 9th August 1862 by the Revd William Burns, Vicar of Farnworth-with Kearsley. 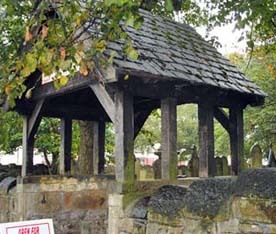 The Lychgate at the St James Street entrance was presented by Dr J Fletcher Smith and his sisters in 1927. The Clergy Vestry was built on to the south east corner in 1906 in memory of James Fletcher of Green Fold Farm with a gift from his widow. 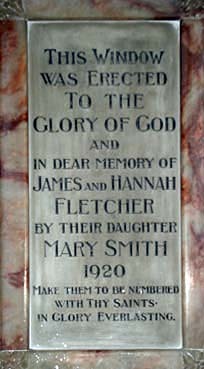 Her grandson Dr J Fletcher Smith laid the memorial stone. The building stone for its construction was quarried at the Highfield Quarry on Marsh Lane. The Choir Vestry at the west end was built in 1964 to mark the Centenary Year and included a toilet and caretakers store. The southern end of the vestry has more recently been converted to provide much needed kitchen facilities. The Churchyard has been extended a number of times over the years and there are now no new graves available. The Parish has difficulty in maintaining the churchyard but are grateful for the help of the Probation Service in cutting the grass in the lower churchyard as often as they are able.